We hope that as our site and community continue to grow, we can use our influence (and dollars) to make a positive impact in the lives of mothers around the globe through love, prayer, and financial support. We can't do it without you! Melanie and Ashlee had the opportunity to travel to Guatemala last April with Children's HopeChest. On that trip they learned of a group of mothers who lack access to education, and are struggling to take care of their kids by foraging through the dump for recyclables. We want to come alongside these mothers by partnering with a local leader, Jomara, who has dreams of launching a co-op and literacy program for them. The Puerta de Esperanza CarePoint is a ministry that cares for the children and families that live in the area surrounding Guatemala City’s largest city dump and market. The community suffers major problems with domestic violence, gang violence, human trafficking, and drug abuse. Therefore, a ministry like Puerta de Esperanza is literally a “Door of Hope” for these children. The primary place the children gather is called “La Terminal” market, which is the city’s largest bus terminal, market, and trash producer. Jomara (left) dreams of starting a support group for the mothers in La Terminal. She told us that many of them cannot read or write, which means they often get cheated from earning a decent wage. She wants to create for a co-op for the mothers, a literacy program and support system where they can learn together and encourage one another. Most programs in Jomara's area focus on the children, but the mothers often get left behind. She wants to change that. Carol (right) will be leading the literacy program. María Luis is a first grade student in our “Women Empowerment” Program at Puerta de Esperanza. She is a peddler and sometimes she sells food at the market. She is from a Mayan background, she is from Totonicapan. When she was a little girl she did not have the opportunity to go to school; the only thing María was able to do was work and help at the house with the “wifely duties”, as a lot of women in Guatemala do. 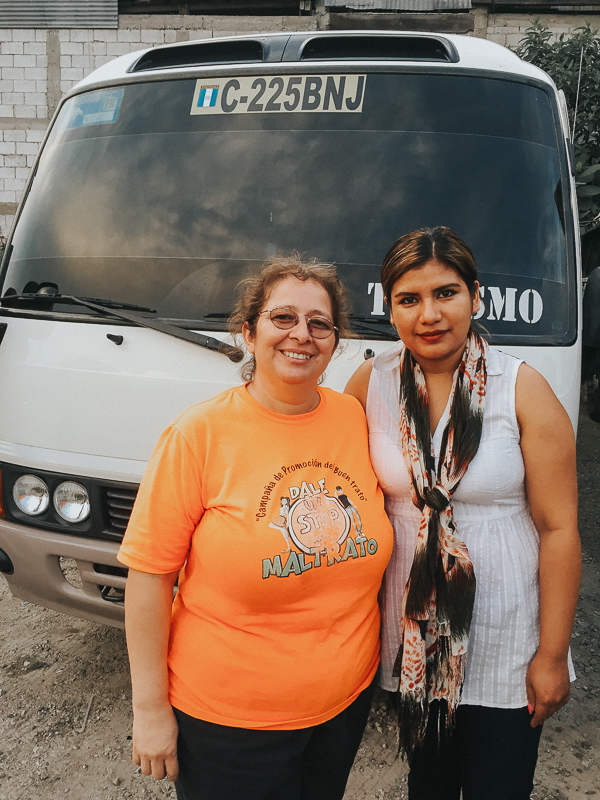 She became a wife a very early age, her husband noticed that in their village there was not a lot opportunities for employment so they decided to move to Guatemala City, at La Terminal. A lot of people believe that La Terminal provides opportunities to start a business or find different jobs, which is true, but there is a lot of competition for the same opportunities. Now, María Luisa has four children, they live in very poor conditions inside of one of the areas at La Terminal. A few months ago her husband decided to leave the family; she became a single mother and the only person who could provide for her family. The four children have support through Puerta de Esperanza. 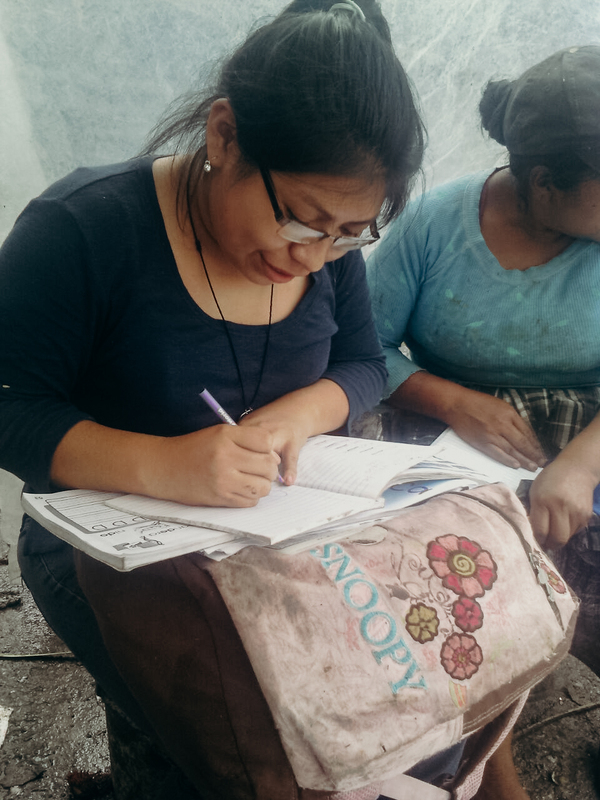 We knew María Luisa could not write or read, so we invited her to be part of the “Women Empowerment” Program. We see a lot of changes in her life! She can identify letters, she started to read short words, she does her homework with her children, and they can support each other to form a better quality time together. María Luisa has a lot of responsibilities now that she is a single mother, and in spite of her divorce, she is working hard to support her family and doing her best to develop herself into a quality person. We encourage María Luisa to keep improving herself in order to have better job opportunities or run her own small business in the near future. We are so excited today to share an impact report for our Mother-to-Mother Care Collective. Thanks to you—our generous readers—our first initiative for the Puerto de Esperanza CarePoint in Guatemala was fully funded over the summer. We are super grateful for your partnership and want to keep you regularly updated on the continued progress of this project! The women who live in this impoverished area of Guatemala City earn their living scavenging at the garbage dump. The Puerto de Esperanza CarePoint provides a safe place for their children to have basic needs met, and our project is specifically centered around the mothers and supporting them as they provide for their children. We want to empower this group of mothers to get the training and opportunities they need to earn fair wages and protect and provide for their families. The local leaders working with HopeChest plan to train and organize the ladies of the community in areas such as child protection, Bible training, birth registration, group therapy, legal advocacy, and how to search for donors. They’ve divided the project into two phases. Because of your generosity, we’re able to fully cover Phase One, which includes hiring a teacher and providing formal, accelerated education for thirty women in the program. Phase One will focus on developing academic skills in women ranging from 15 to 50 years old. The women will be divided into three groups, with one group attending classes on Wednesdays at the CarePoint’s red house property, a second group attending classes right on the street in the garbage dump area on Fridays, and the third group meeting on Thursdays at the red house during the dinner hour. The leadership at Puerta de Esperanza has asked the women to contribute to part of their education, which encourages them to feel personally invested in the program and their own growth. They only have to pay one time, the equivalent of $4 USD, and our program covers the rest. Phase Two will include technical training and business entrepreneurship. The technical training can include baking, cooking, sewing, and other marketable skills. Puerta de Esperanza will begin this phase with eight of the women in the program. The business entrepreneurship component of the project will include business and financial management. After training is complete, the CarePoint will give each woman a small investment to start their own businesses. The staff will regularly assess their progress and provide coaching as needed. So that’s the plan! Just a reminder: this program was created by local leaders who know exactly what their community needs. We simply get the beautiful opportunity of partnering with them and cheering them on. Thank you, again, so much, for your support of our Mother-to-Mother initiative, and we will continue to bring you new updates right here as we receive them!